Sarah Couvillion is a mom on a mission. Underwhelmed by the options available for her daughter in stores, Couvillion took matters into her own hands by launching her online store Plum and Violet in 2014. Since then, her stylish selections have expanded from online and into stores in Central and Zachary. We sat down with Couvillion to learn more about the store, its products and how she finds inspiration. I start my day around 6 a.m. and try to get ready before my daughter Olivia wakes up. I like to have a hot cup of tea and a bit of reflection time before the day really gets going. It helps me organize and prepare. Then we’re off to carpool! I head back to my house to finish up any last-minute chores. I get to my office around 9:30 a.m. and check emails and respond to any messages. I take care of shipping out any orders that come in, and send in any orders that I may need for new releases. I sort through any deliveries that may have come in and take inventory. Later on in the day, I brainstorm with Adriana of Adriana Portraits about different business ideas. Sometimes we’ll do photoshoots to give our readers an inside look at what we do or what is coming up. If I have time before I pick my daughter up, I’ll write a bit for any upcoming blogs. Anything that doesn’t get done before carpool is saved for after Olivia is in bed. 2. What is your professional background? How did you get into children’s retail? I have a degree from LSU in elementary education and I was a first-grade teacher in Central before I had my daughter. In many ways, she was the inspiration for starting Plum and Violet. I couldn’t find cute clothes that I wanted to dress her in anywhere, so I decided to start my own business. I knew owning my business was something I wanted to do and once I had her, it was like a lightbulb went off. 3. When did Plum and Violet launch and how has it grown or changed since then? The website for Plum and Violet officially launched in 2014. Our website has grown tremendously, and we have a physical presence in stores in Central and Zachary. My customers will notice a slight change in the direction we’re taking. We’ll still have cute clothes but that’s just the beginning. I want Plum and Violet to be a community. I’ll be blogging more about issues that are relevant to our daughters and their moms. I’ll be interviewing local ladies about their journeys in their careers and getting any advice they have for young girls. 4. What goes on behind the scenes of your store? Aside from the normal business things like inventory, accounting and social media, I try to take a creative approach to buying clothes. I like to put outfits together so busy moms don’t have to. 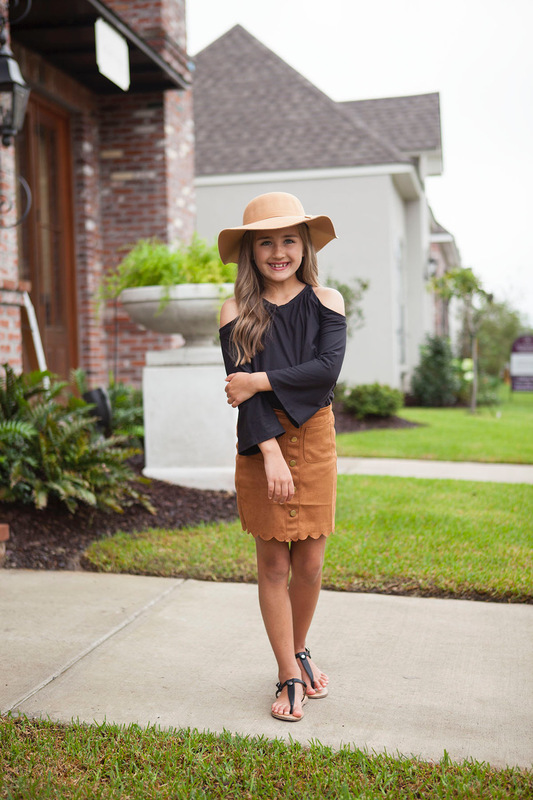 I have a wall filled with ideas of how outfits can go together and what they can be worn with that is likely already in their daughter’s closet. I’m all for versatility! Sometimes I’ll see something in a store or on Pinterest and I’ll brainstorm how to translate that look for my customers. 5. What sets Plum and Violet apart? One of my biggest goals is outstanding customer service. When you call, email or message Plum and Violet, you get me, not some answering service. The great thing about that is I get to know my customers really well. I probably know if your kid had a growth spurt or they have a preference to cover their shoulders. I can help you find the right pieces. I try to go above and beyond for my customers because without them I wouldn’t be able to do any of this. I’m a local girl! I was born and raised in Baton Rouge and I built this business from the ground up. I’m so blessed that I’m able to follow my dream and take my little girl with me. 7. How do you keep your store’s inventory fresh and up to date? I take notice of what’s in stores, travel to market and make sure to ask my customers for their input. The brand representatives I work with are incredibly helpful, and I work really hard to do my best to find what my customers want and need. 8. How do you juggle motherhood and a business? It helps that I involve my daughter a lot in my business. She’s my brand representative and models for me. She also helps me pick things out. I ask her all the time if she likes something I’m thinking of carrying. I also have a great support system. Being a single mom and business owner can get hectic, but all of Olivia’s grandparents are willing and ready to help out in any way they can. I’m so beyond grateful for them. 9. What are a few must-haves for this season? I’m absolutely obsessed with these faux suede skirts we have right now. They’re stretchy, comfy and so cute. I love just about anything in the colors olive or burgundy. They’re the perfect shades for fall. 10. What are some of your best-selling products? In addition to clothes, we sell gift items too. Our absolute best-seller happens to be our slime kits. I’ve sold out numerous times and am currently trying to restock for the holiday season.